With the Windows native driver installed, download and unzip the IDT but cancel the installation. Go into Device Manager to the audio controller (under "Sound, Video, and Game Controllers"). Right click on it and chose to update the driver. Choose to manually find the driver and don't let Windows look for it. Browse to c:\Dell\drivers\R226903 then click "Next". When you restart the laptop Windows will detect your audio hardware and install the IDT driver. Whether or not you can get either the Sigmatel or IDT audio driver installed, the mic array might still not work. The mic array is a function of the optional webcam. I don't know if the webcam on your model will work in 7 or not. There are 2 components to the software, the webcam driver and the Webcam Central software. 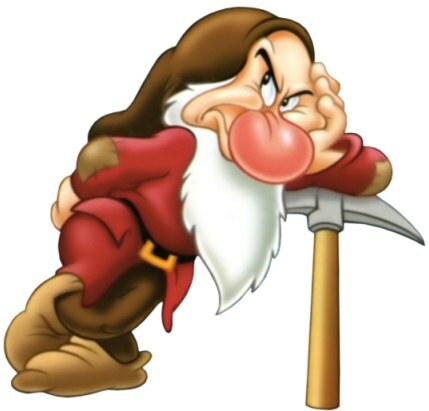 In 7 the webcam driver is incorporated into the OS so you should not have to install it. Try looking for the mic array on the recording tab of the Sounds properties. If there, set it as the default recording device. If not there right click anywhere in the white area and select Show Disabled Devices. If you find it in there, enable and make it the default. 2. Click either All Programs or Programs. 3. Click the Dell Webcam folder, then click the Dell Webcam Manager icon to open it. 4. In the Dell Webcam Manager, click the Dell Webcam Center. If none of that works, there is a monitor driver package that contains Webcam Central that works on some of the laptops but I have not heard of anyone trying it on the 1525. If you try it, get rid of all other webcam drivers and software first. Dell SX2110 Monitor & Webcam Software R230103. Well I installed the dell webcam central, but the microphone still doesn't work. 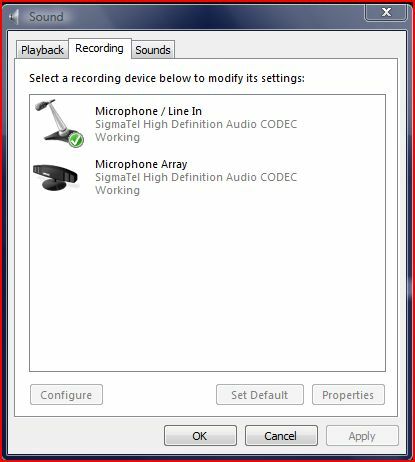 When I go to sound recording I can see the microphone array and it is selected as default, yet it does not pick up any sound at all. It has microphone/line in as not plugged in, the microphone array shows the "sigmate high definition audio CODEC" as as the default device. Do I need to uninstall old drivers? I have tried to install almost every sigmatel driver I've come across in my search for an answer. Thanks for the help so far. Well I installed the dell webcam central, but the microphone still doesn't work. Can you open the application. Sometimes it won't run which affects the mic array. If the application will not open, insert a usb device into a usb port and try again while the application is telling you it is not working. Don't ask me why that would work because I don't know, but dozens of people have confirmed it. When I go to sound recording I can see the microphone array and it is selected as default, yet it does not pick up any sound at all. I assume you are testing it by recording into Windows Sound Recorder? Could be the mic array is not working. They can become defective or the connection can become loose. In the latter case one has to loosen the bezel around the screen to reconnect it. Don't know if it will help but there is an online mic test for laptops with 7. 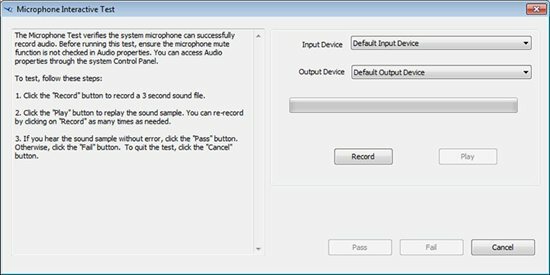 "Sound Problems in Microsoft Windows Microphone Troubleshooting"
Click on "Run the Audio Recording Troubleshooter" to download the Dell Audio Recording Diagnostic tool. 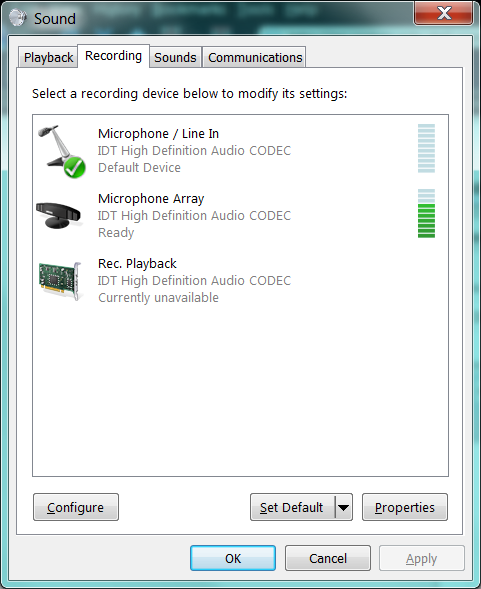 the microphone array shows the "sigmate high definition audio CODEC" as as the default device. Do I need to uninstall old drivers? I have tried to install almost every sigmatel driver I've come across in my search for an answer. Because you see "Sigmatel Codec" in the Sounds properties it means you have a Sigmatel driver installed. When you are running the native driver you just see "High Definition Audio Device". The only Sigmatel driver I think you should use is the Vista one for the 1525, R218148. I would suggest deleting all other Sigmatel folders from the hard driver at c:\Dell\Drivers\. The audio drivers folders are the ones that have a subfolder named WDM. I would try the IDT driver if nothing else works. Well I uninstalled the sigmatel drivers and tried to install the IDT, but that didn't work either. It has a green phone icon next to microphone/line in. then next to microphone array it just has a green check mark and says its the default device. If I were to reinstall windows would this improve my chances of getting something working? Any ideas? I doubt that reinstalling 7 would help. If the mic array is there -- it was optional at the time of purchase -- and undamaged -- it ought to work under Vista. I don't have any new ideas, just the ones previously mentioned. Check for loose connection, download and run the Dell Audio Recording Diagnostic tool, try the R230103 Monitor & Webcam software, see if Webcam Central will open without an error message. Another test you could try is the microphone test in Dell's PC Checkup. I believe that driver was listed by jimco in the first response to your original post or it is the same number anyway. Didn't it work then?